Need advice on best practices for your specific application? Call 1-800-FilterMag (800-345-8376) to speak with one of our expert consultants. Many of our consultants hold certifications such as CMRP, CRL, CLS, and MLA. We’re happy to help! Within the tight clearances of lubricated mechanical components, normal wear generates tiny steel particles that are carried away in your oil. These particles are so small they pass right through any standard oil filter. When the oil circulates back into the system these same particles are carried into every lubricated space. This particle-laden oil will continue to lubricate but it will also cause an exponential increase in wear while it circulates. The longer you use the oil, the greater the wear. FilterMag extracts normal, wear-causing steel particles from your oil with its powerful, focused, magnetic field technology. These particles are trapped on the inside wall of the filter or canister and are thrown or wiped away when you change the filter. FilterMag XTs are permanently installed and require no additional upkeep. With CT products, simply slide the FilterMag off the old filter; snap it onto a new one and it goes right back to work protecting your equipment. Why can’t FilterMag consumer products be used for industrial applications? Each FilterMag product line is designed for specific applications. The consumer line of products works great for light to medium duty applications with spin-on filters. The demands of most industrial applications require FilterMags designed with larger, stronger, and more powerful magnets. The materials used are also more durable. FilterMag Industrial products are so durable they carry a five-year warranty. My equipment uses cartridge filters, not spin-on filters. FilterMag XT industrial products are designed for thick-walled, cartridge style canister filters. FilterMag CT industrial products are designed for spin-on style filters. My equipment already has oil filters. Why bother with FilterMag? Most oil filters are only rated to capture particles down to about 20 microns. The majority of wear in your equipment is driven by particles that are smaller than 20 microns. Eliminate those particles, wear drops dramatically and reliability goes up. FilterMag significantly limits normal wear on your lubricated components. How do you feel about your equipment lasting 30% to 60% longer? How can particles too small to be seen with the naked eye hurt anything? Will FilterMag invalidate my equipment’s warranty? No. FilterMag’s external snap-on design is completely non-invasive. It has no effect on the flow of oil to lubricated parts. Can FilterMags be used to extend my oil drain intervals? FilterMag can help you safely extend your current oil drain interval while providing maximum protection for your equipment. Extending your oil drain interval will require a sophisticated Used Oil Analysis (UOA) program. Assuming your oil is kept cool and dry, FilterMags will be a major asset in keeping your oil clean. If your system is properly sealed, most oil contamination will come from internal sources (primarily normal wear). Normal wear means microscopic steel particles. Collecting those particles as they are generated prevents them from circulating between moving parts and causing more wear (and more particles). If your oil stays cool, clean, and dry, it will remain usable for extended periods. Why can’t I just stick an ordinary magnet to the outside of my oil filter? While FilterMag is a simple to use solution, it is derived from complex science and advanced engineering. Placing magnets on the outside (or inside) of your filter won’t have nearly the same effect. Every FilterMag is a three component system of which magnets are a key component. The size, shape, and configuration of our magnets are computer designed to focus a magnetic field at the proper depth inside your filter. Our patented FluxCon shielding further focuses the magnetic energy into the filter while shielding the engine compartment from any magnetism. To see more about the anatomy of a FilterMag, click HERE. Do FilterMags stay in place on their own or do you have a method to attach them? FilterMags stay in place by their own magnetic strength. Since 1999 we have not had one reported incident of a properly installed FilterMag falling off an oil filter. For example, we have significant experience with off road racing. Specifically, racing such as the Baja 1000 race. Many of these racers run FilterMags as they fly through the air and come crashing down from the jumps for more than 1,000 KM. We have never had a report of a lost FilterMag. Shown below is one of the top off road racers in North America, John Holmes, who runs FilterMags for every race. If you believe your conditions might be more extreme, there is an additional method that can be used to further secure them. We use this method on aircraft. A vibration resistant stainless steel band clamp can be placed around the FilterMags. Safety wire is used to ensure the filter cannot come loose. The band clamp may also be safety wired for triple protection. CLICK HERE to see an instruction sheet from our AeroMag product that shows a standard installation on an experimental aircraft. Have you experienced any problems with the extra weight on the filter, as the load on the mounting thread rises and the gasket may get loose leading to oil loss? What is your recommendation for this? Do you have calculations about this influence? Once again, we have never seen an oil filter come loose while FilterMags were installed. We have never had a report of oil loss caused by FilterMag. Because of this, we have not done any calculations or simulations. Obviously, the moment arm is short and the masses involved are small. When a pair of FilterMags is installed, the additional mass is fairly evenly distributed, so it seems unlikely that high enough rotational forces could be created to loosen the filter. Next to vibration, the force created by accelerating the mass of the oil contained in the filter is probably the greatest influence on the compression sealing gasket. Of course, adding a small additional mass to the filter will have some effect, but once again, it seems unlikely to be enough to cause any problems. If this is a serious concern in an extreme environment, an oil filter can be safety wired after installation to prevent it from loosening under any circumstances. I know magnets can lose their power at high temperatures. Will the operating temperature of my equipment affect FilterMags? Most ordinary magnets do start losing magnetism around 178°F. Operating temperatures of that degree could be an issue in many types of equipment. The magnets used in FilterMag products are all high temperature rated, neodymium alloys. Industrial magnets of this type are significantly more expensive than common magnets, but they will hold up in even the harshest environments without any loss of effectiveness. After installing FilterMags, how can my Used Oil Analysis (UOA) show an ISO 4406 particle count drop while my wear metal analysis shows iron readings remaining the same? In many cases, both iron counts and particle counts drop after the installation of FilterMags. Occasionally, particle counts drop without a corresponding drop in iron. The primary reason is that ISO 4406 particle counts (measured in particles per ml) and wear metals (measured in PPM) are two very different tests. The laboratory instrument used to perform wear metal analysis is typically an Inductively Coupled Plasma (ICP) Spectrometer. The largest particle that can even enter the test chamber of an ICP is typically about 8-10 microns. The average particle analyzed by an ICP is less than 4 microns in size. Laboratory instruments used to perform ISO 4406 particle counts only analyze particles larger than 4 microns. Thus, the particles analyzed for particle counts are very different than those analyzed for wear metals. Will FilterMag interfere with the anti-drainback feature built into my oil filters? No. The anti-drainback valve is typically silicone rubber and is not magnetic. Will FilterMag interfere with the bypass spring in a spin-on filter and keep a clogged filter from going into bypass? No. The bypass spring is located in the non-threaded (round) end of the filter away from any magnetic field. FilterMag’s patented design directs magnetic energy only into the oil flowing along the sides of the filter. What about additional plumbed-in filtration, such as bypass and centrifugal filters? Additional plumbed-in filtration can certainly help maintain the quality of your oil. The biggest issue is how they are plumbed in. Only about 3–10% of the engine oil flow is diverted through these systems. As such, they do not capture particles as quickly as a system that filters almost 100% of the oil flow. Each time a particle recirculates, it can create wear and generate more particles. Capturing particles as they are generated is the most effective means to reduce wear and increase reliability. In two independent tests, FilterMags were added to existing bypass systems on diesel engines. In both cases, particle counts dropped an additional 50% over the effect of the bypass system. A few additional points as brought to us by our customers: Centrifugal filters are comprised of moving parts and thus, susceptible to mechanical failure. All bypass systems introduce connection points that can (and often do) leak. The filter element that captures the particles is disposable and thus, an ongoing cost. FilterMag requires no plumbing and is a one-time purchase. How is the design of the FilterMag superior (aside from the surface area of the hemispherical outer magnet) to simply implementing a small magnet inside of an ordinary oil filter to aid with particle capture? In other words, is it 'overkill'? Secondary efficiency is entirely a sub-function of primary efficiency. Each particle that is not captured on the first pass through the filter will recirculate back to the lubricated moving parts. If that particle moves between two lubricated surfaces and is of a size between the maximum clearance and the minimum clearance, it will be caught between the surfaces and cause “three-body abrasive wear.” Three-body abrasive wear will then generate more particles. At least one study reported by Fitch, B., et. al. showed that one particle in diesel engine oil can create 19 new particles during a typical oil change interval. By using FilterMag to capture that one particle when it is made, there is no need to deal with the additional 19 particles (because they are never created). This means that the secondary efficiency of FilterMag is very high because of the extremely high primary efficiency. Thus, wear is significantly reduced and reliability improved. The standard for reporting particle counts during a used oil analysis is ISO 4406. FilterMag routinely achieves a 50-85% reduction in particles (1-3 code drops). We have seen reductions as high as 98%. Independent studies conducted in engines show that lubricated component life may be extended 30-60% by reducing particle counts 50-75%. How does the FilterMag product compare to the concept of using a magnetic drain plug in the oil pan when it comes to capturing particles circulating in engines? Once again it is all about efficiency. A magnetic drain plug uses a small magnet producing a tiny, weak, localized, magnetic field. It is designed to be used as a visual indicator to determine if there is a mechanical problem with lubricated parts. If that problem is producing particles large enough to be seen with the human eye (typically 40-80 microns) it gives warning of a problem when examined during an oil change. A standard drain plug is not generally considered to be any type of filtration. What happens if ferrous debris (or a clump) that has been magnetized rips off from the magnetic field and manages to get past the filter media and/or the by-pass valve somehow? Would that be a greater cause for concern than before when the actual debris was in simpler particulate form? Let’s start with the concept of magnetizing particles. With FilterMag, the particles are drawn to and held within a magnetic field. They remain in place on the inside filter wall because of the strong magnetic field, and to a much lesser extent, some mechanical binding. The captured particles do not become “magnetized.” Therefore, should any particles escape the capture point they are not likely to come off as a “clump” or attach themselves to another point outside the field. Magnetic fields are highly ordered. This means that as particles are captured, they are self-arranging along the lines of magnetic flux. If a sudden change in flow force should occur or the equipment suffers a severe physical impact, it is likely that the particles in the weakest captured positions may be discharged. This would be a very low number of particles. It is extremely unlikely that a particle in a weakly captured position could build up a significant number of particles on top so as to create a “weak link” allowing the discharge of a large number of particles at the same time. The only way a large number of particles could likely be discharged at the same time would be the removal of the magnetic field. FilterMags should only be removed from the filter during an oil change. FilterMags do not fall off. Another reason FilterMags are constructed using high strength, rare earth magnets is to ensure they will never “fall off” of a filter. 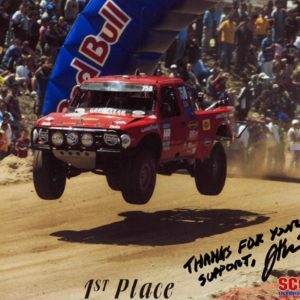 Off road racers (such as those racing in the Baja 1000) have never reported the loss of a FilterMag. Similarly, in industrial applications (such as 400-ton haul trucks bouncing down mine roads) FilterMags stay in place. FilterMag XT Industrial products are so strong; they are considered to be a permanent installation. They are designed for cartridge style filters. What about non-ferrous particles? Any recourse for such particle(s)? We do, however, routinely see drops in non-ferromagnetic wear metals during routine used oil analysis. These include lead, tin and copper. The cause of the drop is the secondary efficiency of FilterMag. By removing the harder particles as they are created, they do not recirculate and cause wear on the softer metals such as those found in plain and rolling element bearings. Once again, the result is longer life of lubricated components and increased reliability. One other aspect of non-ferrous particles involves external contaminants. If your lubricating oil or hydraulic fluid should become contaminated from an external source, FilterMag can reduce the damage. A typical example would be a compromised breather system on an engine that is allowing dirt to enter the cylinders and thus the oil. Dirt is primarily comprised of silica and other non-ferrous particles. The dirt will cause abnormal three-body wear as it circulates in the oil. Abnormal three-body wear creates steel particles. By capturing the newly created steel particles, the total number of wear causing particles in the oil does not rise exponentially. This limits the abnormal wear being done by the dirt. Less wear means less damage and lower maintenance costs. FilterMags also buy you time to discover and repair the root problem. If the Filtermag removes finer particles and results in cleaner oil, does this actually result in longer component life? Contemporary data supporting longer lubricated component life by better filtration starts with the landmark study by Sayles and Macpherson in 1982. Their research focused on rolling element bearings, but is applicable to other lubricated components. They showed that wear is directly related to the efficiency of oil filtration. Their idea was that wear is affected by the size of hard particles in the oil. Particles too large to fit between lubricated surfaces would have little effect on wear because they cannot get between two lubricated surfaces. Particles smaller than the minimum thickness of the oil film will also have little effect on wear because they do not come into contact with both surfaces. In their study the particles causing the most wear were in the 3-20 micron size. Their findings showed that removing particles in the oil, down to 3 microns, increased lubricated component life by 600% in rolling element bearings. The now famous “Macpherson Curve” shows this in an excellent graphic format. Over the following decades many studies demonstrated similar results in multiple lubrication environments. Machinery Lubrication magazine published the results of a meta analysis conducted by Jim Fitch on more than 100 of those studies. The results are now well known in tribology circles as the “Noria Life Extension Tables.” In a nutshell, running cleaner oil does extend the life of equipment. There are four different categories of equipment in these tables. Each category of equipment shows different life extensions depending on improvement in oil cleanliness. Oil cleanliness is defined by ISO 4406 particle counts specifically looking at particles in the 6+ and 14+ micron categories. Generally speaking, life extensions range from a modest 10% for minimally cleaner oil in gearboxes to more than a 60% improvement for a modest cleanup of oil in diesel engines and hydraulics. Experts may sometimes dispute the exact numbers in these charts, but the tribology community fully accepts the concept that removing small hard particles from lubricating oil will extend lubricated component life. To further examine “Normal Wear,” consider how the Dynamic Clearances of lubricated components in an engine change as they move. When the clearance is open to its maximum, oil flows between the components. The particles that are small enough to be carried into the oil film space between components cause the most wear. When the clearance decreases, the particles are trapped between the moving parts. This process will also create more small steel particles, thus propagating the wear cycle. FilterMag removes the most common small particles that oil filters cannot: those made of steel. Removing these small steel particles breaks the wear cycle and extends the life of lubricated components.